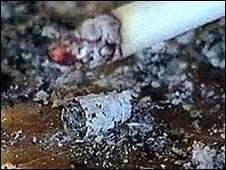 A 14-year-old from the West Midlands has overdosed on nicotine gum, prompting an investigation by an anti-smoking organisation. Aidan Williams chewed up to 45 pieces of the gum which had been given to a friend of his at Menzies High School, in West Bromwich, the Sun reported. He spent a night in hospital after becoming light-headed. DECCA, which gave out the gum, said it was thought to be the first time such an incident had happened. Margaret Storrie, service manager for the drug education, counselling and confidential advice (DECCA) team, confirmed the group did give out nicotine replacement gum to help young smokers quit. But she added any young people who receive the gum are told they should not give it to anyone else. "Aidan overdosing on gum like this is the first time such an incident has happened and we are disappointed to hear about it. "Aidan's friend who was originally given the gum would have been told very clearly how often to use it by the worker who gave it to him," she said. The service will be talking to Aidan and the friend who was originally given the gum, she added. She said DECCA had been asked by the school to go in and help a specific pupil stop smoking. No-one was available at the school to comment.